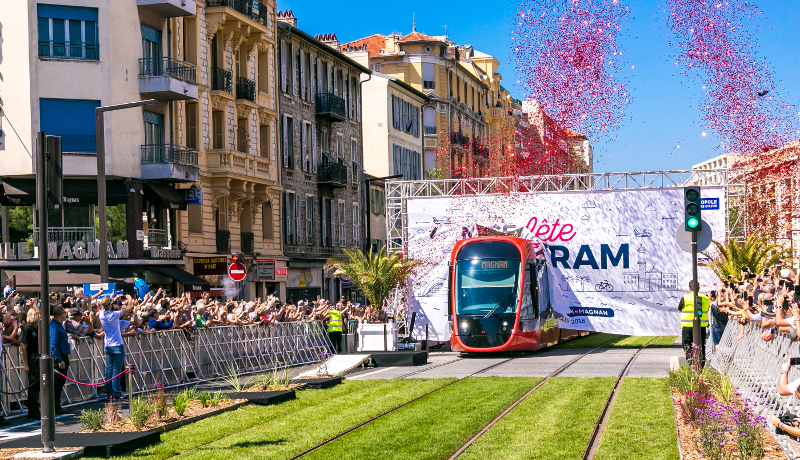 Alstom commissioned its new-generation tram Citadis X05, complete with its innovative SRS charging system, for the first time on Saturday 30 June on the Cadam-Magnan section of new tramway line 2 for the Métropole Nice Côte dAzur. Presided over by Christian Estrosi, Mayor of Nice and President of the Metropole, the inauguration took place in the presence of Georges-François Leclerc, Prefect of the Alpes-Maritimes department, Renaud Muselier, President of the PACA region and Member of the European Parliament, Charles Ange Ginésy, President of the Alpes-Maritimes department and Jean-Baptiste Eyméoud, President of Alstom France. The first passengers were able to discover the design, created by Ora Ïto, as well as the travel comfort provided by this new generation of 44-metre-long Citadis trams: 40% window surface, LEDs for soft, homogenous lighting, large individual seats, travel information on extra-wide screens and improved accessibility with double-doors along the entire length of the tram. The innovations of the Citadis X05 also make it easier to operate: passenger capacity has been increased by 10%, with a 20% increase in the passenger exchange rate at stations and a reduction of over 20% in preventive maintenance costs. For the first time ever, Alstom has also commissioned its SRS ground-based static charging technology coupled with the Citadis Ecopack energy storage system. This system allows the tram to circulate without overhead contact lines throughout the entire journey. SRS automatically charges the tram when stopped at the station during passenger exchange (under 20 seconds), in complete safety. Electricity is stored in the onboard Citadis Ecopack devices, guaranteeing the trams autonomy between two charging points. SRS builds on the technical and safety principles of the proven APS solution (trams of Bordeaux, Reims, Dubai). Its a tremendous source of pride for Alstom and its teams to participate in this project, a catalyst for innovation and an international showcase of French railway sector expertise. A new generation of trams, a new charging system, the Nice tram will also be the first connected tram as of Spring 2019 with a tram-to-ground Wi-Fi communication system, said Jean-Baptiste Eyméoud, President of Alstom France. Nine of Alstom's twelve French sites are involved in the design and manufacture of tramway line 2 for the Métropole Nice Côte dAzur: La Rochelle (studies and tram assembly), Le Creusot (bogies), Ornans (motors), Valenciennes (interior layout), Villeurbanne (on-board electronics, passenger information, tram-to-ground Wi-Fi communication), Aix-en-Provence (speed measurement), Tarbes (traction), Vitrolles (SRS energy charging system) and Saint-Ouen (design coordination, electrical substations).